Damien Chazelle directs a revolutionary, musical masterpiece, made particularly great by outstanding performances from both J.K. Simmons (Winner of Best Supporting Actor at the 2015 Oscars) and Miles Teller (That Awkard Moment). Andrew Nieman (Miles Teller), a young and determined jazz drummer starting out at a the very prestigious ‘Shaffer Conservatory of Music’ sets out to make it in to Terrence Fletcher’s (J.K. Simmons) professionally recognised studio jazz band and represent the school at the highest level. His dream is to become a world-known great in jazz drumming like Buddy Rich, and he is committed to do whatever it takes to make it. Fletcher, the most respected professor at the school, and without a doubt the most feared, strongly believes in pushing his students beyond their limits whichever way it may be; shouting at them, embarrassing and disrespecting them, slapping or even throwing chairs at them. From the beginning you witness his tenacity with his class, and it is his intensity throughout which creates the viewers’ empathy with Andrew’s experience. Throughout, you are routing for Nieman and hoping he lives up to the moment and proves his worth, which is what makes the final half hour of this feature so nail-biting. More importantly, Miles Teller’s drumming performance in impeccable and is a true homage to method acting, which was much unexpected from the ‘That Awkward Moment’ (2014) and ’21 and Over’ (2013) comedy star. Considering the excellent casting of this lead role, the impressive music editing and mixing, which won the feature a couple of Oscars (Winner of Sound Mixing and of Film Editing), and the beautiful, but gritty cinematography, giving the viewer a real feel for a music school environment and the overwhelming impression of New York on a young musician trying to make it, one would think what can make this feature a true great? Enter J.K. Simmons! Among many roles, Simmons is most famously known as Jonah Jameson in Sam Raimi’s Spider-Man Trilogy (2002-2007), perhaps the most accurate casting of a comic strip character ever. However, what he brings to this feature is revolutionary. He single-handedly turns a film about a drumming school into almost a sporting epic, comparable with the likes of Coach Carter and Remember the Titans, but he does this through being almost a villain in the audience’s eyes. The passion, ruthlessness and aggression he brings to Terrence Fletcher make him unwatchable and hateful at times, but strangely enough, we all feel and want what Andrew Nieman strives to achieve, greatness, but more importantly Fletcher’s approval and admiration. 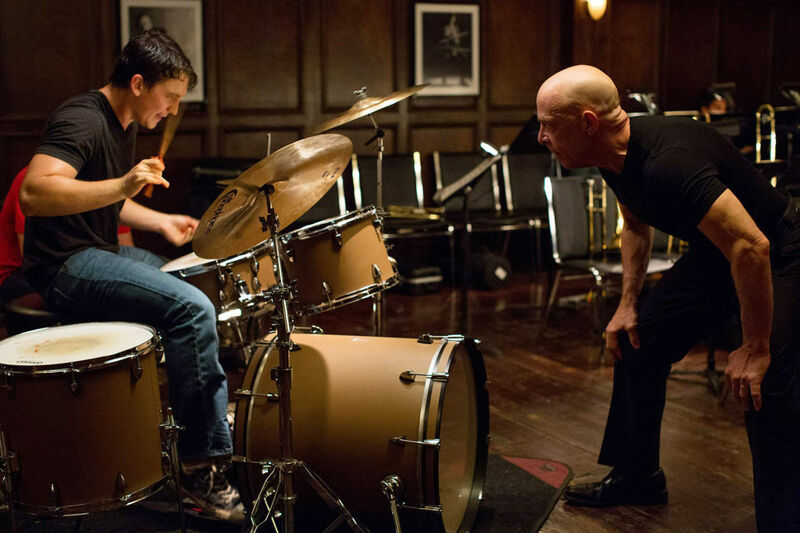 From trailer to full feature, Whiplash remains one of my strongest recommendations to watch for 2015 so far, surpassing Birdman and American Sniper. Even though you may not be able to distinguish when Andrew Nieman is “dragging”, when he is “rushing” or how he is off-beat without being a drumming professional, you can’t help but fall in love with the world of Jazz. To witness a film that leaves you physically and emotionally drained at the end of it is a rare and special thing, so just make sure you watch it! Recommendation: There are still some screenings out there (due to recent Oscar wins), so if you can get out and see it, Please Do! However, if not – wait for the DVD/Blu Ray etc. – This film deserves all the money it gets!